We can't thank you enough for being a Member of Towpath Credit Union...but we're going to try! 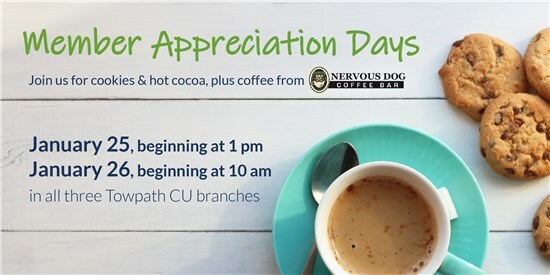 To show how much we love our Members, we're hosting a Member Appreciation Day on January 25 (beginning at 1:00 pm) and January 26 (beginning at 10:00 am) in all three Towpath Credit Union branches. We will have cookies and hot cocoa available in the lobbies, as well as coffee from local coffee shop, Nervous Dog Coffee Bar. So stop by, say hi, and treat yourself!